Landlords always need to do paperwork but many are not aware of the full significance of some crucially important documents. If you have an idea about the most important files that you might need to access again and again then it will become a lot easier for you to file them properly. This is why we have created a list of necessary documents that every California landlord needs to keep in an easy to find file. What are the best practices for saving documents? Please remember that there are some really important documents that California landlords need to keep handy to ensure instant and secure access to them whenever required. Since we live in a digital age so there is no need to keep piles of files as you can easily store them in electronic versions on Google Drive and/or Dropbox. This is important because by storing them on the web, you will be able to access them from a variety of devices namely mobile phone, laptop, tablet or desktop, etc., while you can check them out even when on the go. Most landlords store paper versions of their important documents. However, by storing paper only versions, you are making all your data vulnerable to damages such as house fires, burglary, or other natural disasters, which would be detrimental for your precious documents. Let’s now check the most important documents that a landlord needs to access repeatedly and therefore, should be saved properly. This checklist is basically created to document the property’s condition before you let the tenant move-in to the rental unit. As per the law, your property must be in the same condition, ignoring normal wear and tear, when the tenant moves out as it was when they moved-in. If it isn’t so and the property has received severe damages then the landlord has the right to deduct the repairing cost of damages from the security deposit. However, if you have found yourself in such a situation as a landlord but you don’t have the move-in checklist then the matter would be resolved according to your word against theirs method. This may or may not benefit you but if you have a move-in checklist then both parties will resolve the issue amicably. Moreover, having a move-in checklist would give tenants peace of mind since they would know that you won’t be charging them for existing damages. Please note that the move-in checklist should be filled in the tenant’s presence and both must sign the document. Adding pictures of property also helps in making a comparative analysis. Getting an application form filled by applicants who wish to rent your property and their guarantor(s) is a good practice. It not only explains the most important personal, professional and financial details of the prospective tenant but also will provide information about the guarantor who will be paying the rent if the tenant fails to do so. Landlords need to the get necessary information for running a credit check and perform tenant screening to finalize the best candidate for occupying the rental unit. We suggest that you provide your tenant with a list containing information about emergency contacts. You may either make a separate form for explaining how to deal with emergency situations and whom to contact or include the terms in the lease agreement. Provide at least three emergency contacts information in the form. Similarly, you must ask your tenant to provide you three emergency contacts information so that if the tenant goes missing, stops paying rent or gets involved in an accident or falls sick, etc., then you will know where to call. No matter if your property is new or old and big or small you must have a lease where you will list all the tenants and every tenant must sign the lease. It is important because by signing the lease you are actually creating a legally binding agreement between you and your tenants and everyone would be then required to follow the rules and terms laid out in the lease. If any of the two parties involved violates the lease agreement, the other will be able to take due action as per the law. Mention the rent amount, due date of paying rent, whether rent will be paid every month, bi-monthly, quarterly or annually, accepted payment mode in the lease and the penalty for delayed rent and the security deposit amount. It will also include the timing of property inspection, what situations would lead to eviction and what will happen when you decide to sell the unit. Maintenance and repairing related conditions will also be part of the lease and every other relevant aspect will be included. Always keep a signed copy of the lease with you. For points that are not covered in the lease or you forgot to include something in the lease, then addenda will be prepared to add all the missing details. All you need to do is date the document, write the points and take signatures from all parties including you. The lease addendum must be stored with the lease agreement. A lease renewal letter is sent to the tenant by the landlord about two months before the existing lease expires. The letter is sent to determine if your tenants want to renew the agreement or move out. If your tenant wants to stay then a new agreement will be prepared stating the new terms and new rent and both parties will sign it again. If a new lease is not signed then the tenant will become month-to-month renter. You must keep a sample letter and fill in the required information every time you send a renewal letter to your tenants. You must keep the documents containing mortgage information of your property or properties including refinance information and record of improvements in the property that you have made so far like any expansion or renovation to the unit. It doesn’t matter who pays for the utilities, it is important to keep a list of utilities you are providing at each rental unit of yours. This letter would contain information about what the tenants are required to do when they decide to move-out. This letter should be sent to the tenant a few weeks before the scheduled move out and would explain to them by what time and date are they required to vacate the property. It is quite similar to the move-in checklist and explains the condition of property after tenants move out. You can provide the list to tenants before they move out so that they repair the damages (if any) or you can perform an inspection when they have moved out. Don’t forget to record every single detail. 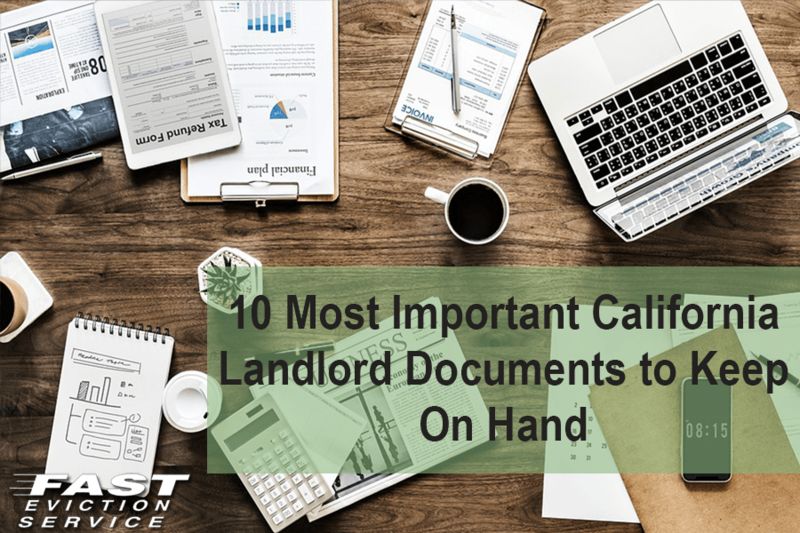 Keeping these top 10 most important California landlord documents on hand can save you a lot of time and headaches in the future, and are key to running a smooth property management operation.